The Girl's Favorite quilt block has some interesting patches for you to try. The units featured all around the centre patch (a square in a square patch) use both half square triangle pieces and quarter square triangles, but are sewn together, not as squares, but to make larger patches. These patches add the interest to the block. I chose to construct the centre patch with the method that uses all squares, rather than using triangles -- but the result looks just as you would expect. 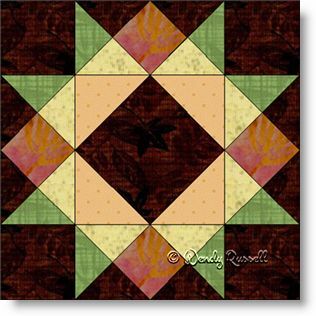 This method causes a bit more waste fabric, but many quilters prefer this to working with all of those triangles. The pattern includes two pages with graphics to take you through the construction of this patch using this method. And finally, this block is constructed as an uneven nine patch. The sample quilts illustrated are both set on point but in different manners, thereby resulting in very different looks.